This mod replaces the Ice & Blood menu screen with the original one used in Fallen Angel. It can be used with any game version or any combination of mods and patches. Obviously you won't need this if you are still playing original Fallen Angel. 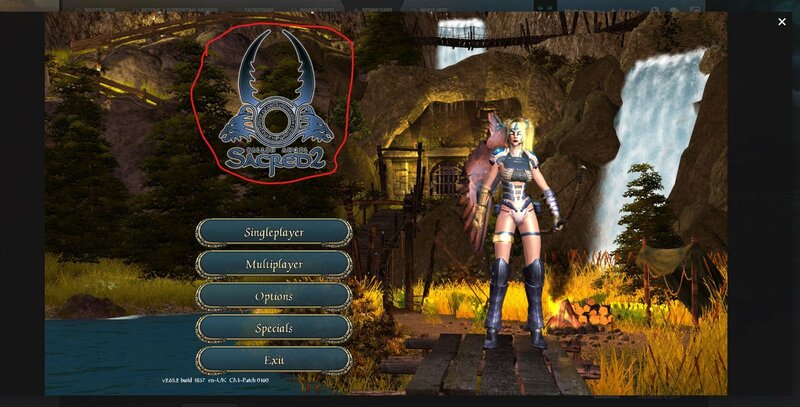 Extract the contents of the Fallen Angel Main Menu zip file into the MODS folder created in the Sacred 2 root folder, after installing the Generic Mod Enabler there. You can use the mod enabler to enable/disable the Fallen Angel menu as you wish. Added a second menu screen, from the Fallen Angel demo. This is wonderful! I will enjoy seeing this as my default screen now, as I am a bit fatigued with the Blood Wood loading screen. Thanks Flix! Well done, a big thank you from Hungary! ¿Podria alguien por favor subir la pantalla de la versión demo otra vez? está dañado. Could someone please upload screen demo version again? is damaged. The copy of the Fallen Angel Main Menu that I have is truncated, as seen in the image above. If there is a clean version that has no errors it would be greatly appreciated to have the file updated. You mean the black sky? You can see that it my screenshot too, to a lesser extent, as I had a different resolution. Based on your screenshot you're at 3840 x 2160. I think the higher your resolution, the more obvious the "borders" of that landscape will be. That menu background is pulled from the demo, so it shouldn't be too surprising that it doesn't play too well with the full game + expansion. Yes, that is the resolution that my screen is set to. I have noticed that about half of the time the black border is quite a bit smaller and almost unnoticeable. Thanks for the information; I will use the Main Menu as it is, for it is so realistic, evidenced by the remarkable details and the impressive lighting effects. First thank you for this mod, I really like the vanilla version that I tried today. I noticed however that the logo you have is the vanilla though mine is the CM one, the background is perfect, here is juste the icon that doesn't change..
Would you have an idea for changing that please ? Thank you for your fast response !